3D Car Identification - ZYLIA PORTABLE RECORDING STUDIO. MULTI-TRACK MUSIC RECORDING WITH ONE MIC. The aim of the project was to design and develop a next generation model for surveillance vision systems and traffic monitoring applications. Designed system was envisioned to use novel and advanced techniques for automatic content analysis based on stereoscopic video sequences. 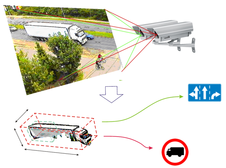 The most important goal of this project was to create algorithms for stereoscopic video processing and analysis to obtain information about vehicles, especially for estimating their size and classification of their types. Automatic analysis of traffic congestion, which takes into consideration different types of vehicles. Automated traffic violation monitoring and reporting system. Automatic detection of vehicle types. The project was funded by the National Centre for Research and Development (NCBiR), Poland, Grant No NR02-0022-10/2011.